What is Soldat? Well, why spend 10 minutes writing long paragraphs explaining how I feel about this game, when I could sum it up in one word? If I had to choose, the word would be "AWESOME". Okay, fine, I'll write a long review anyway. 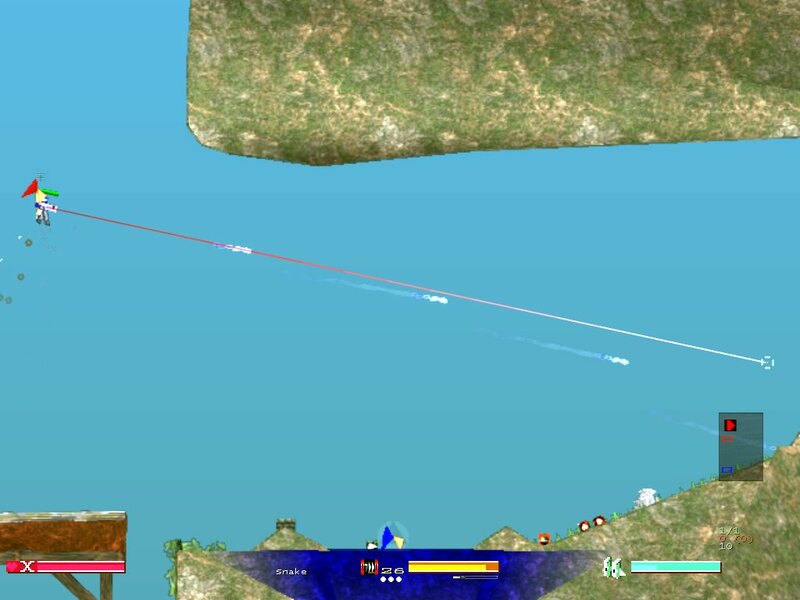 Soldat is a fast-paced 2D shooter where you can play online or offline. Unlike most games, the AI in this game is actually quite skilled, but online play is still the tops when it comes to playing this game. The game bears the classic WASD controls I've grown to love, and operates very smoothly. There are 6 game types are available. Such as: Deathmatch, Teammatch, Pointmatch, Rambomatch, Capture The Flag and Infiltration [One Way CTF] and tons of weapons, like the Desert Eagle, AK74, Spas 12, Ruger, M79, Barret, and even a minigun, plus tons of others. There are primary weapons and secondary weapons, leaving plenty of options and combinations to try out until you find the perfect match. You can spar with the AI or test your skills online. You can also register to open more options, but registering is a luxury - not really necessary, but may enhance gameplay for some. You can also customize your character. You can do simple things like changing his name, to a bit more excessive things, like whether or not he has dog tags, or has a Mohawk. The sound effects in this game are very good - they're crisp, clear, and every weapon has a distinct sound, from the buzzing of a chainsaw to the boom, chik-chik of a shotgun. The yells and sounds of blood of a fallen enemy splattering against the wall leaves you with a triumphant feeling, only to be interrupted by a playing coming behind you, and you suffer the same fate in an instant. The graphics are well-detailed and the animation of characters jumping and rolling around is smooth, and overall very good, but nothing visually stunning. For such a small file size, this game's graphics sure pack a punch. Like I said, registering gives some enhancements, and the extra options for player looks and interfaces are a good example of that. As soon as you start playing Soldat, you either like it or don't. Chances are, you'll love this game, because it's very good, as the score, as well as the other user reviews, clearly exemplify. 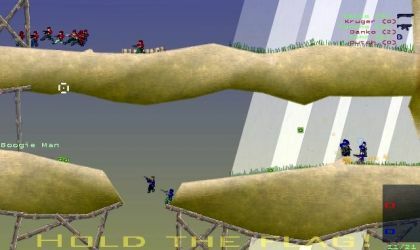 Soldat is a fun, yet simple, gaming delicacy, and with such a file size as only 12 MB, what have you got to lose? Other than hours a day, playing this cruelly addictive game! I leave you with these three words: DOWNLOAD SOLDAT NOW!!! Never in my gaming life have I found a game quite like Soldat. As a gamer, my favorite genres are platforming and shooter, and online play is a must for me. Soldat manages to combine all three of my loves of gaming, and still be fun in the process. The maps are awesome! It surprised me how strategic this game was, and, for the first time in a side-scrolling shooter, I had to actually think about what was happening and how to best deal with the situation. This layer of strategy makes the game replayable to infinity... and beyond! The weapons system is easy to use and understand. You may want to charge in with your shiny minigun, but that may not be the best idea. You have to find a weapon that works for you, and this is something that even some retail games fail to do. Although playing against real people online is definitely better, bots can be fun too. So, if you're new to this game, the bots can help you and be fun at the same time. Again, something many retail games fail to do. The graphics are OK, but aren't important to the game. Lastly, the controls are spot-on, from movement to shooting to flying, making the gaming experience all the better. Great controls are, for the third time, something that many retail games fail to do. Character customization is included, and it includes everything. While not the best ever, being able to change the look of your character is a feature that some retail games fail to include (man I sound like a broken record here.) If you haven't figured it out yet, I really like Soldat. So much, in fact, that I can safely say that it's one of my favorite games I've ever gotten freeware. And I've gotten a lot of freeware games. I can also say that this game is better than a lot of games on the market today. So, if you're looking for an addicting game that you can pour your life into, get Soldat. How do I say this? Amazing. For a 12mb game, it is very compact and has awesome graphics. Not only that, the variety of game characters and the ability to edit your own is an awesome feature. The environments are great and many look amazing, with detailed foliage. 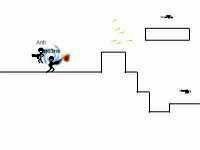 Even though it is 2D, it will happily bring every gamer back to the 2D shooter. Now on to the fighting. The game has a huge variety of weapons - automatics, chainsaws, flamethrowers, grenade lauchers, rocket lauchers, dual pistols, rifles, knives, shotguns, hand to hand and many more. The game also contains the use of grenades, which become a very useful weapon - even when your dead you can still get a kill. The gameplay is great - smooth and very entertaining. 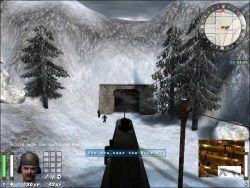 There is several different game types - deathmatch, capture the flag and survival. With these, you have the option of changing human types - if the game is realistic with low health or with high health. 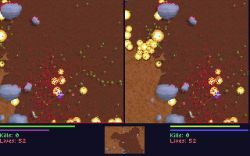 There is also power ups, such as invinciblity and fireball mode. Yet there are still cons - the online play can be frustrating as it is difficult to communicate with your team mates. Often when you launch a game, it will not work and greatly frustrates the player. Compared to the pros, this is little competition, making it a great game. There is also the option to become a registered user with a small cost but this allows you other features as profiles, more detailed characters and game hosting. Overall, this is a awesome game and one of the greatest freeware games and in my opinion, the greatest freeware shooter ever made. You have to be mad not to download this. 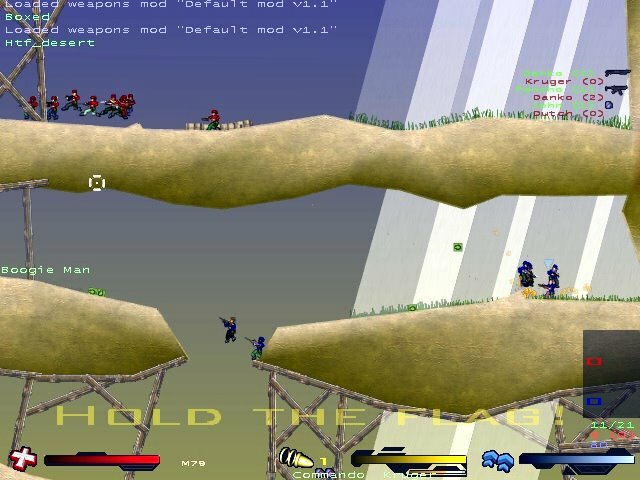 Soldat was a game I saw once when looking at the Top-Rated lists of Acid-Play. Considering it was high rated and a shooter, I gave it a go. Now, 2 months later, I can't stop playing it! Graphics - Not amazing but some nice blood splatters and death animations. Register for extra options for player looks and interfaces. Sound - Quite good. Sounds are distinct to each weapon, chainsaw a loud buzzing, Steyr Aug a fast put put put and explosins from the M79. Also there is 3 ingame music tracks to listen to while playing. If you register for 9 dollars US, you get the option to listen to MP3 music as well. Lastability - There will always be a player that is equal or better than you at Soldat so you can find a challenge quite easily. Addictive gameplay made for lots of fun. Gameplay - Excellent. 6 game types are available. Such as: Deathmatch, Teammatch, Pointmatch, Rambomatch, Capture The Flag and Infiltration [One Way CTF] 10 primary weapons and 4 secondary weapons [Primary - Desert Eagles, HK MP5, Ak74, Steyr Aug, Spas 12, Ruger, M79, Barret, Minimi and Minigun. Secondary - USSOCOM, Combat Knife, Chainsaw and Law] lots of game options, etc. Registering opens more options. Overall - Though it would be nice to have all that extra stuff for free, registering more of a luxury and doesnt really make the game a lot more enjoyable. Don't worry, if you haven't registered it doesn't mean you get limited time trail or limited plays, just opens more options. This is one amazing game! Awesome modes, great music (and you can input your own and do tons of other stuff for about nine or ten dollars). Though I would say it isn't really worth it. It has great sound effects too, like the explosion of a grenade launcher and the sound of a planted machine. Also there's no idiots online insulting you when there getting fragged. Though the bots are kinda dumb even on higher levels, though they'll get in a few frags unlike most games in this genre. Now here's the game info. You basiclly play one of six different game modes. There is Rambomatch, Deathmatch, Hold the Flag, Capture the Flag, Infiltration, Pointmatch and Teammatch. Pick one of four teams, set up how many bots you want and pick one main weapon and one secondary weapon. After that you try to complete the game modes objective while competing against the other team(s). There's also online and Lan play to frag your fellow Soldat players. So thats what I have to say about Soldat. It's a good game - get it! I give it a Excellent out of Excellent! It was not long ago I downloaded this gem and started playing. When I first started playing this game, I was a real noobb to it. After about 5 minutes of playing with the bots, I started to get a feel for the game, so I went online to a server one of my friends directed me to. So, i was playing online with a few of the self-named "Pros". After I got a little bored of beating up bots and getting owned online, I decided to see about the whole modding aspect of this game. This is what really made the game for me. I was able to change around the weapons the way I wanted to, make new maps, host online servers and share what I made with the rest of the Soldat community. I have been playing this game for a while now, and my skills have gotten better. Now I'm able to own it up with some of the big boys on their realistic servers, while running a crazy server of my own with miniguns that launch rockets or grenades. This game has probably got to be one of the best gaming experiences I have ever had the pleasure to enjoy. To put it simply, Soldat is an amazing game that will keep you in its clutches of never ending addictedness for hours. The controls are easy to memorize and after a few games it will be second nature where all the commands are and you'll be jumping into enemy fire like an idiot, but it will be really fun! Something that will greatly increase the replay value of this game is the online play with dozens of servers to choose from and all the modes to play in - you wont be going anywhere soon! Something else that's great about the game is the ability to invent your own modes. 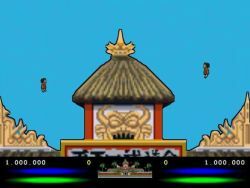 Like some players have made specific maps where instead of fighting you have to go through an obstacle course and in some maps, race your enemy through the courses to see who gets to the end first. Some other less popular modes that have been invented by players is races and coop maps. Well, I've talked enough! So, anyway, I recommend this game if you love online shooters or are just looking for a game that will waste many hours of your life.